The downturn in the agriculture economy continues to impact the state with the latest evidence another drop in the price of farmland in the annual Iowa State University Extension survey. Wendong Zhang conducts the survey. “Essentially a 5.9 percent decline. It’s the first time that the Iowa farmland values have been declining for three years in a row since the 1980’s farm crisis,” Zhang says. The average price of an acre of farmland fell to $7,183 dollars. The three years of falling prices come after the peak in 2013 when it took $8,713 to buy an acre of land. Zhang says one key factor is driving the downward trend. “Mainly the weak commodity prices, the low corn and soybean prices. And this time the livestock margins are no longer that strong either,” Zhang explains. He says none of the 99 counties were exempt from the drop. “No county saw an increase this time– all counties dropped — ranging from a two percent decline in the southern-scentral to a nine percent in western-central,” Zhang says. Zhang says the drop in farmland prices will likely slow, but won’t end immediately. 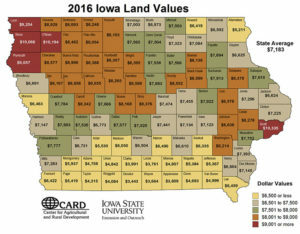 “The next year or two we will probably see modest declines at the state level — although we’re already seeing some promising signs that south-central and north-central Iowa, are seeing some growth in land values over the last quarter. So, there might be some bounce back, ” Zhang says. But he says it could take three years for the whole state to turn things back around. The 3-year drop in value causes some to think history might be repeating itself. “A lot of people are now concerned about whether we will see a replay of the 1980s farm crisis,” Zhang says. “I think the probability is probably low.” He says landowners were saw some very good earning years between 2003 and 2013 to help their bottom line, which puts them in better position to handle the latest declines. And he says greater lending restrictions have also kept landowners from getting in over their heads. “And you have much greater and hopefully stronger coverage from crop insurance. So I think overall the factors are better suited to weather the storm. I think people who are over-leveraged or bought too much machinery, they need to watch the working capita,” Zhang says. The most expensive farmland was in eastern Iowa’s Scott County at $10,335 an acre. Two counties in northwest Iowa were right behind, with O’Brien County at $10,194 dollars and Sioux County at $10,066 an acre. The least expensive farmland was in Decatur County in south-central Iowa at $3,443 dollars an acre.